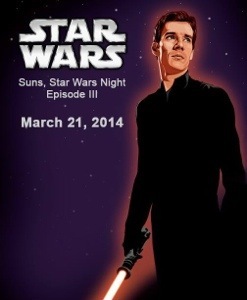 The Phoenix Suns celebrate Star Wars on March 21st as the Suns take on the Detroit Pistons. The night will have a Star Wars theme with exclusive shirt giveaways and other fun Star Wars stuff. Make sure to get your tickets now to enjoy the fun in a galaxy not so far away. Check out the official page for all the details.